With three other BP kits to choose from, which one will be the most popular remains to be seen, but the Velvetone will be hard to beat. A sure-fire hit. Powerful projection with warm, full tone. Excellent toms. Quality finish. We'd like to see a 16-inch deep bass drum. The lacquer matches the existing Velvetone snare drum. The small tom isolation mounts are tidily-designed, bracketed off just two lugs. Shield-shaped lugs are already featured on the Velvetone snare drum, and their design is nicely echoed in the floor tom leg brackets. Butter burst brings out the extravagantly swirling grain of the Italian burl maple veneer. Since 1997, Black Panther has been such a successful snare brand; it was surely just a matter of time before we had a full Black Panther kit. There are 14 snares but Mapex plans just four Black Panther kits. The first two are based on the Blaster and - the review kit - the Velvetone. Mapex tried out various different Black Panther snare shell make-ups before deciding on the four that would also make good kit shells. The Velvetone has hybrid shells of 1.7mm maple, 3.4mm walnut and 3mm burl maple, the same on toms and kick. That adds up to 8.1mm, which is a thicker-than-average shell by today's standards. You certainly notice the extra weight. "There's almost a clatter as the head reacts and springs back, but everything after that is abundantly lush and dark." The burl maple forms the exterior of the shells and is finished in Butter Burst Gloss Lacquer to match the existing Velvetone snare drum. It shows off the extravagantly swirling grain pattern of the Burl Maple, stained from dark to natural and back. It's a luxurious and expensive-looking veneer, in truth like a suite of Italian rococo furniture. Bearing edges are described as 9:1 which we take to indicate nine plies cut at 45° from the inside right up to the outer edge where there is a single-ply round-over to the outside. The edges are excellent, though we were puzzled by slight variations in the shell interiors - the smallest tom's edges, and indeed its whole inner shell, were silky to the touch, whereas the 16-inch tom's innards were less smooth and the bass drum noticeably rougher. The 16-inch and 12-inch toms were also about 3mm out of round, which is not that unusual but we would suggest is the maximum acceptable for shells in this quality bracket. The Velvetone is only available as a single shell-pack with classic dimensions - 22x18-inch bass, 10x8-inch and 12x9-inch mounted toms, 14x14-inch and 16x16-inch floor toms. We're promised some further add-on sizes for the future. The two small toms are fitted with Mapex's isolation bracket, the design of which has been given careful thought. It's the same principle as, but lighter than, the Orion bracket. Although it only grabs two lugs rather than the more usual four, it appears to be solid and stable since it grabs those two lugs from both above and below. The result is a less conspicuous mount. Each tom also has a TH684S ball-and-socket holder and AC910 multiclamp for mounting from cymbal stands. Completing the distinctive look of the toms are the triple-flanged, 2.3mm Sonic Saver hoops. Like Slingerland's vintage classic Rim Shot stick savers, the top lip of these hoops is bent over and in towards the centre rather than out like other triple-flanged hoops. They are already featured on the Velvetone snare, as are the small, single-ended shieldshaped lugs. The shield design, by the way, is nicely echoed in the floor tom leg brackets. Bass drum claws have come on a long way. Since the demise of 'T' rods the drum key-tensioned bolts are usually enclosed for protection. Mapex's substantial claws are fully recessed and look a bit like rocket ships. Everything about these drums shouts luxury. The deep gloss and lustrous chrome, the rounded and lacquered bass drum hoops, the chrome-on-black Black Panther badge, the distinctive small shield lugs and curvaceous Sonic Saver hoops. So often doing reviews it's murder trying to describe the sound, struggling to differentiate one Chinese-made kit from the dozen others that emerge each year. And they're all pretty good nowadays. Now and then, though, you're blown away from the start. And that's the case with the small Velvetone toms. Whenever a review kit arrives we eagerly rip open the smallest box, grab a stick and with small tom in left hand, wallop it with the right. Wow! That nearly blew our heads off! The power and projection, the attack and body are something else. Yes, the drums came beautifully tuned, with the perfect heads - Remo Suede Ambassadors - so all was set for a good impression. But all the same, that was some tom. We were equally struck by the 12x9-inch mounted tom - fat, powerful warm tone. Setting up the full kit there's the chance to feel how the bass drum and toms sit together, how they blend. All four toms are beauties with no weaknesses, and the bass drum - with Powerstroke-3s (Suedes again) - blends seamlessly. This is a seriously good-sounding kit. There is a heartiness to the sound, some of which you can put down to the Suede Ambassador batters which seem warmer than normal Ambassadors. They have a rich, smooth surface which is slightly calf-like, a luxurious classic feel. Add to this the thick shells with their inner core of walnut that gives the tone extra character, while the sharp 1:9 outer bearing edge maximises the head diameter and clarifies the attack. The two floor toms are just as good as the small toms. There is a Krupa-like heat to your tom blasts. Full depth comes from low-mid tuning, winding up to that spot where there is still just the hint of a flap on stick impact, followed by a deeply satisfying rumble. There's almost a clatter as the head reacts and springs back, but everything after that is abundantly lush and dark. We loved this tuning, but for the sake of a rounded review we also wound up the toms - top and bottom heads - to close on a bebop/modern jazz-funk pitch. Here the precision was even more evident but the dusky timbre of the shells was not lost. As for the 22-inch bass drum, we're glad it's 18-inch and not 20-inch deep. In fact we'd like to hear a 16-inch, but the 18-inch is a good compromise, avoiding the muddiness we find with 20-inch mega-deep drums. More obviously than the toms we thought it needed tuning up a little higher than usual, bringing out more of the complex tone of the hybrid shell. As usual we felt no need to put damping inside - the Powerstroke perimeter flaps being enough for acoustic purposes, certainly, when not miked up. All in all, the Velvetone does what quality kits do, it encourages versatility and experimentation. With the long-lived popularity of the Black Panther snare range Mapex now has a strong and original brand identity. Apart from looking fabulous the Velvetone truly impresses with its sound. 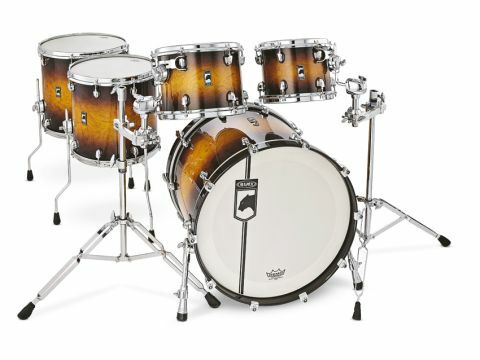 The heavy-ish shells add power and projection, while the walnut-maple instils a slightly darker and warmer tone which will appeal to all styles of drummer.